Initially, I rolled my eyes a bit when I saw a thread in our forums posted for a game called Infinity of God. After the sweeping success of the Infinity Blade series, tacking “infinity" onto your title in any way has just about as much effect on me as if it was “doodle" or “angry." That’s to say, the predetermination is that what I’ll find will be a low quality knockoff of the highly successful games that have made those words ubiquitous on the App Store. 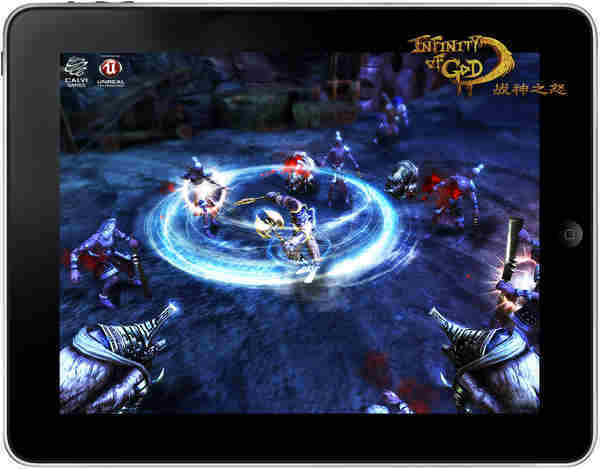 For better or worse, Infinity of God actually does not resemble Infinity Blade so much, but it definitely does not hide the fact that it’s a God of War-inspired game. In fact, it appears that in the developer Calvi Game‘s native Chinese, the subtitle reads as “Wrath of God of War". And so it goes. A few more tidbits of information can be found at Asian gaming blog Ewtang.com, and while I’m not totally sure how much is lost in translation, it looks like Infinity of God is already in the review stage with Apple and waiting for approval, at which point it will hopefully be released this month for $5.99. We also know that the game is being developed in Unreal Engine 3, the storyline will follow a classic Chinese mythology named Shan Hai Jing, there will be 10 unique upgradeable skills for your player, and two game modes including a Story and a Racing mode. The game will be compatible with 3rd generation hardware and up, and will have additional enhancements for iPad 2 and iPhone 4S devices. I haven’t totally figured out if this is some dodgy knockoff that will look great on the surface but contain little substance, or if this will be the type of high end action game we’ve all been waiting for but just seems dodgy due to language barriers. Either way, I’m at least interested enough to give Infinity of God a spin if and when it launches sometime this month.